I had seemed to have spent most of my life on the back of a Harley until, in 1978, a chance meeting with an out-of-work photographer, in a small hotel in the Scottish Highlands, led me to start managing. I love photography and have represented some of the World’s most respected photographers including Sir Don McCullin (with whom I have worked for over 30 years), and the two great, late photographers Terence Donovan and Richard Avedon. Our small office oversees all the production for the shoots for which we are commissioned and, over the last 39 years, we seem to have worked for every major client imaginable. Apart from the love of what I do, I love my three girls : Florence-Ray, Tilly and Scarlett. Picture by Jim Fiscus. 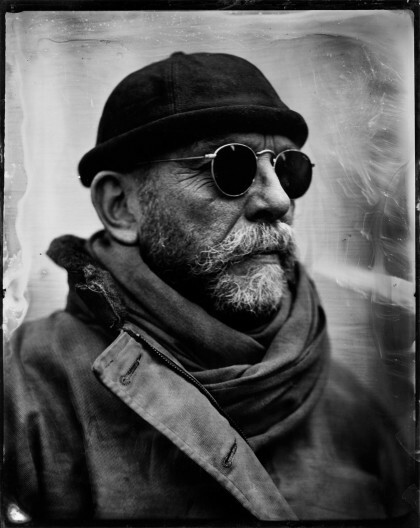 Shot as a tintype, the photographic process first used in 1853.